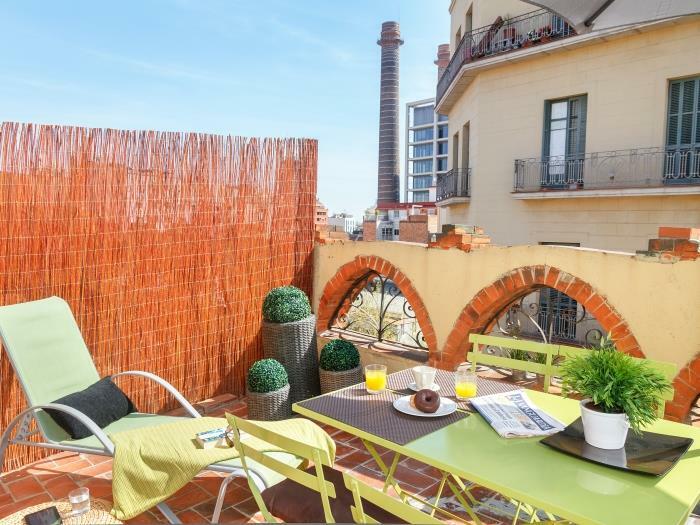 The Vila apartment (HUTB-001519) in Barcelona is a top-floor studio with a nice private terrace located on the fourth floor of an art nouveau building with an elevator. 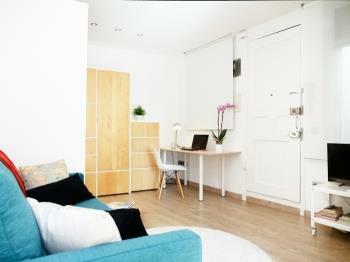 This studio is 40 sqm, plus a sunny private terrace of 20 sqm. 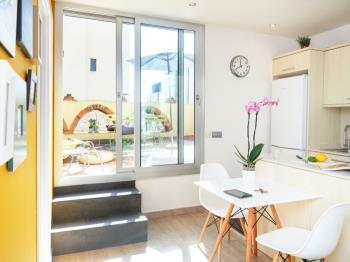 This studio apartment in Barcelona has one central living space within which the double bed is partially separated. 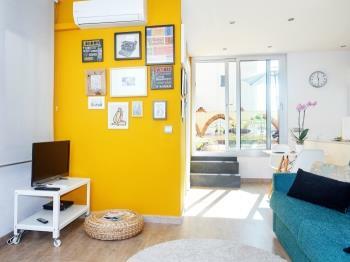 The living area and the kitchen share the main space of the studio, where you can relax watching TV or using the free Wifi available in the apartment. 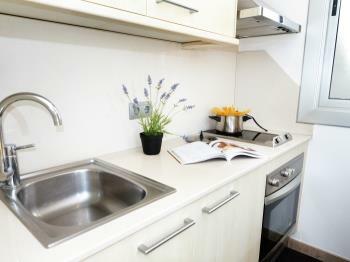 The kitchen comes fully equipped, ideal for a self-catering vacation. The bathroom comes with a shower. The terrace is equipped with sunbeds, chairs and a table, so you can have a meal and enjoy and relax at any time al fresco, a truly wonderful feature of this apartment. This penthouse (HUTB-001519) will allow you to relax while enjoying an exceptional location in Barcelona. The property has an open concept so all the spaces connect to each other. 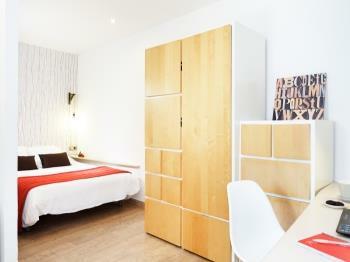 The bedroom has a double bed and a small closet with a chest of drawers where you can place your belongings. This connects to the living area, where there is a comfortable sofa bed and a TV with satellite. Next you will find the dining area and the kitchen, which are fully equipped so you can prepare your meals in the apartment. From here you can go out to the large terrace, where there is another table with chairs and sun deck chairs. In the apartment there is air conditioning and heating. 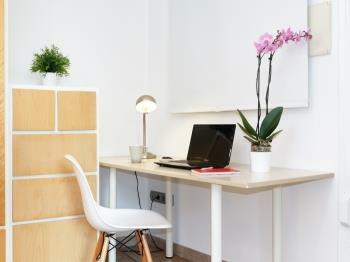 Do not hesitate to contact us if you have any doubts to prepare your stay. During checkin, a member of our staff will show you the floor facilities and will explain what you can find in the neighborhood and how to move around the city from there. 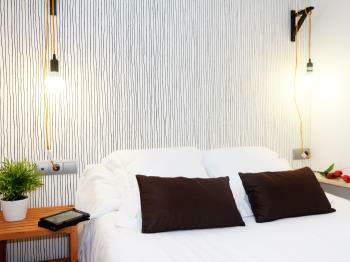 During your stay, you can contact us via e-mail or via telephone. We will provide you with our 24-hour active emergency number. 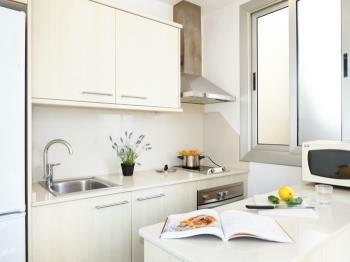 The Poblesec neighborhood is ideally located to give you an easy access to various points of the city. It is also one of the quietest in the center and has a great culinary offer. 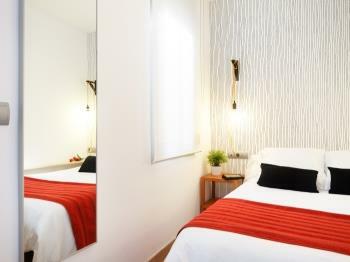 Paral·lel Avenue is 3 minutes walking from the apartment and connects with the area of Drassanes, where you will find the sculpture of Colón, Las Ramblas, Port Vell and Acurium among others. On the other side of Paral·lel Avenue, you will find Plaça Espanya, where the Fira de Barcelona venue is located and the Magic Fountains of Montjüic among others. Also nearby you will have the Montjuïc Mountain, a very large natural park with views of the city. You can walk to the historic city center easily from the apartment, but the area is also well served by public transport. 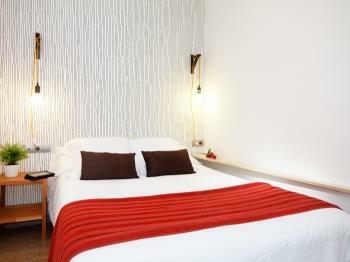 The metro stop Paral·lel is located 50 meters from the apartment. There you can get metro lines 2 and 3 (L2 - violet and L3 - green) and also the Funicular. The L3 - green, will take you to Parc Güell. The L2 - violet, to Passeig de Gràcia and the Sagrada Familia. The funicular will take you to Montjuïc. There are also several bus lines that you can use. For example, if you want to go to the beach, you can take the D20 on Paral·lel Avenue. The apartment Vila (HUTB-001519) is a modern studio located in the attic (5th real floor) of a modernist building recently rehabilitated and with elevator. 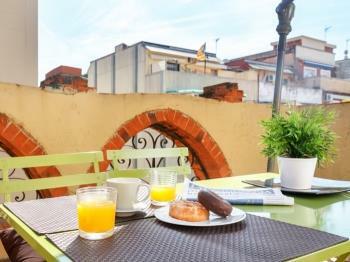 It has an area of ​​40 m2 plus a private terrace of 20 m2 (a real luxury in the center of Barcelona). The interior space is divided into two main rooms and a bathroom with shower. The first room is partially separated from the rest and is where the double bed is located. The living room and kitchen (fully equipped) make up the rest of the studio. The air conditioning and the free WIFI connection finish giving a perfect finish to this beautiful studio. The terrace is equipped with table and chairs that allow to enjoy this space for breakfast or dinner outside and also with fantastic sun loungers that make it a pleasant area where you can enjoy the sun and the good weather of Barcelona. 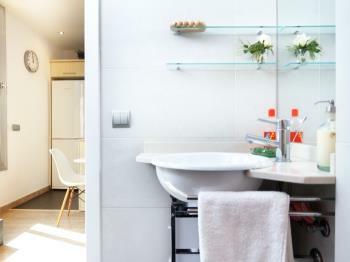 This apartment is ideal for couples who want to enjoy the most of the heart of Barcelona, ​​and is just a few minutes walking from Las Ramblas and Port Vell.